You are currently browsing the daily archive for May 22, 2013. 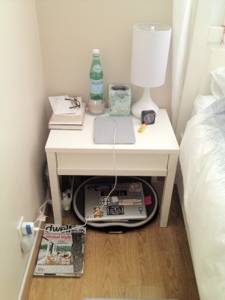 This morning, as I was tidying up our bedroom, I decided to take a quick snapshot of the nightstands by our bed. On one side, it looks very plain & boring, while the other side looks cluttered full & “cozy”. This is one side of the bed. It holds practically nothing on top of the nightstand except a lamp, bottle of water, a box of tissues & a small bottle of dry skin lotion. However, trust me when I say that the drawer is full of everything (chargers, glasses, nail clippers, headphones that’s never used…etc.). A laptop & work bag is usually tucked in the nook under the drawer & has a magazine rack tucked to the side to store an iPad & old magazines barely read. This is my side of the bed. It looks cluttered at first glance, but I think it looks cozy. I have everything I could possibly need before I go to bed right at my fingertips! I enjoy reading (casually more than avidly), so I will always have a small stack of magazines & books next to my bed in case I get the sudden urge to read something. My drawer is not nearly as full as you-know-who’s. I’ve got a few essential items tucked away inside (pens, sticky notepad, my cheap Panasonic noise-cancelling headphones, nail clippers, a few dollar store nail files). 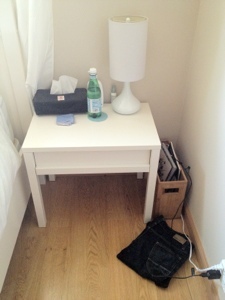 I also keep my laptop underneath the drawer along with my can’t-live-without laptop cushion. Don’t let all of the stuff on my nightstand fool you. It may look “full”, but it IS organized!! Being the neat freak that I am, I wouldn’t have it any other way but my way. I keep a lot of things by my bedside because I hate getting out of bed multiple times just to get one thing here & there. I like to sit in bed before I go to sleep & watch TV and/or surf the Internet on my laptop. I always have the habit of doing lots of things just before going to sleep. That’s my time to really relax & unwind.